» Auto Mains Failure System » Safty Devices (Alarms/Auto) » Single Phase Alternators » Brushless Alternators » Battery » For power de-ration due to changing composition of gases , altitude , temperature and inlet depration contact us. » Maximum Hydrogen Sulfide(H2S) not above 0.2 %, CO not above 20 % , CO2 not above 15 % , maximum mosisture 8% ,minimum available methane 60 to 100 % . (Ratings provided at 80 % methane ) » The excess presence of non combustion able gases will reduce the power rating of the engine without any predetermination. 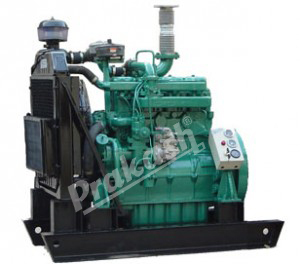 PRAKASH highly efficient self Excited, Self Regulated, screen protected, drip proof, suitable for continuous operation ,1 or 3 Phase 230 / 415 Volts, 0.8 pf, 50 Hz, Class F insulation alternator confirming to IS:4722/IS:13364/BS:5000. Provided with IP 21 protection,10 % overloading and capability of starting the motors at 3 times the rated current of alternator. Engine and Alternator are mounted, coupled, aligned on a common rigid base frame, having provision for antivibration mounting and holes for safely lifting of complete D. G. Set.